A risk-controlled put strategy is a better bet than owning the stock outright, even with Larry Culp at the helm. General Electric (GE - Get Report) is tumbling some 7% Friday afternoon after JP Morgan's Stephen Tusa cut his price target on the stock to $6 from a previous $10, saying that GE's recent earnings release was worse than expected on almost all fronts. I just don't see a good reason to buy or own the stock here, so I'm playing GE by shorting puts instead. First, it appears to me that where there's still smoke, there's still fire. Tusa stated in a research note that forecasts for GE's free-cash flow and EBITDA have moved materially lower. He also talked about deteriorating run-rate fundamentals and maintained his "Underweight" rating on the stock. 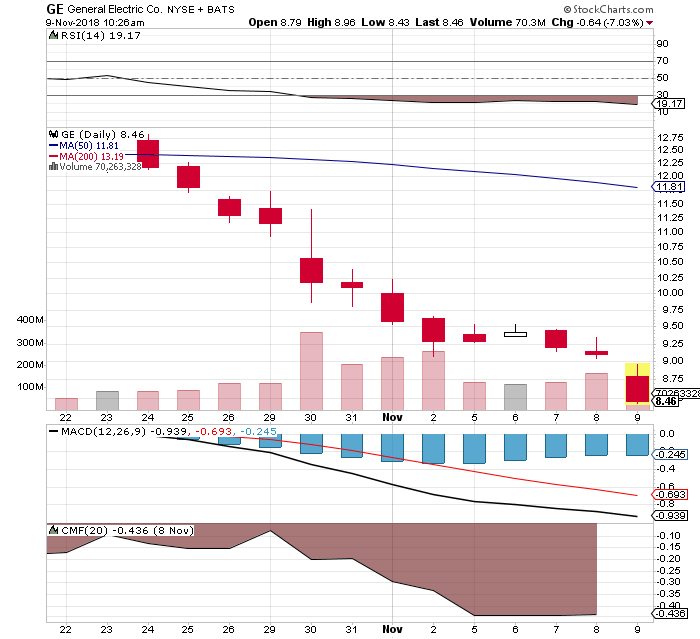 Another very highly respected analyst, John Inch at Gordon Haskett, left his $10 price target in place last week, but mentioned the possibility of GE falling to $5 a share "assuming that GE Capital does not ultimately face insolvency." Boy, that's encouraging! Despite GE recently naming a new and highly respected CEO in Larry Culp, Inch believes that the bull case for the stock has been based on a "sum of the parts is greater than the whole" view of the company. However, the analyst also wrote in a note that GE can't dismantle itself effectively, as the company needs its current base of business to support the GE Capital unit's "tens of billions of dollars of debt securities." Yikes! Well, I'm short a cascading series of puts that expire next June. Most of these are still running with strikes that remain out of the money -- but not all of them will be if these Tusa and Inch prove to be spot-on. I believe that new CEO Culp is no blithering idiot, but I also believe what Tusa and Inch are trying to tell us. I'm currently short GE June 2019 $9 puts, but those are against me and I don't think you want to go there given that they're currently selling for around $8.30. Sell one GE June 2019 $7 put for about 70 cents. 200 shares at a $6.59 net basis (the average of the first put's $8 strike price and the second put's $7 strike price, minus the average of your $1.82 option credit). Now, options trades are always risky, but the above trade isn't Willie Mays patrolling center-field at Shea Stadium late in his career. I can bless a risk-controlled shot like this. And in case you're wondering, June 2019 $5 GE puts are only paying 22 cents as I write this. At the time of publication, Guilfoyle was long GE puts.